VeryPDF PDF to Word OCR Converter is a professional converting tool aiming to help users to convert scanned image PDF to editable Word. PDF is short for Portable Document Format File, whose files can be opened and viewed in different systems. VeryPDF PDF to Word OCR Converter can help you to convert PDF to Word. To convert PDF to Word, firstly, run VeryPDF PDF to Word OCR Converter, whose interface is as below. In the interface, to add source files, click Add PDF File, select source files in the open dialog. You may also drag and drop source files into the interface. Remove and Remove All are used to remove items in the process queue. After the operation of loading source PDF files, click the dropdown box Output Options, choose OCR PDF file (Language: < Language>) to set the application in OCR mode, and to recognize the text of specified language. To select a targeting format, click the radio button MS Word Document (*.DOC) or Rich Text Format (*.RTF) in group box Output Formats. The group box Page Range is used to set the conversion page range of PDF files, which consists of All Pages and Select Range. To set the page range, click Select Range, and input the page numbers in the edit-boxes of From and To. If input PDF files are protected by password, please input the correct password in textbox PDF Password. To convert PDF to Word, click Convert, select the objective folder, and then the chosen PDF files are converted Word with text extracted from image. 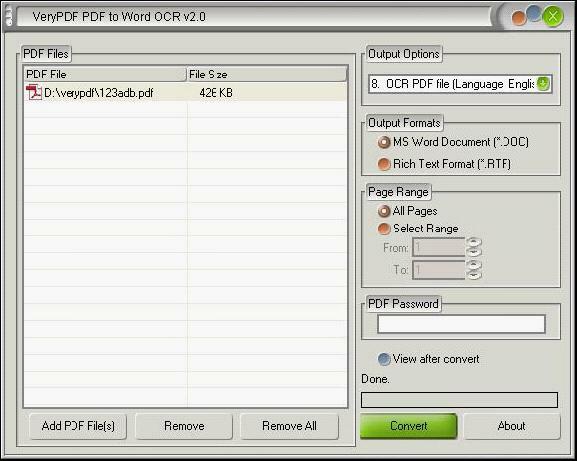 You may click the link to see the features of VeryPDF PDF to Word OCR Converter.